By : Enertech Labs, Inc. Phase Separation in Gasoline’s containing Ethanol is now a major problem for nearly all users of gasoline. Whether you use gasoline as a fleet operator or for your family car, classic car, boat, personal water-craft, motorcycle, snowmobile, ATV, RV, lawnmower, weed-whacker, generator, or any of the thousands of other types of equipment that use gasoline engines; you are being affected by Ethanol in your fuel. Phase Separation describes what happens to gasoline containing Ethanol when water is present. When gasoline containing even small amounts of Ethanol comes in contact with water, either liquid or in the form of humidity; the Ethanol will pick-up and absorb some or all of that water. When it reaches a saturation point the Ethanol and water will Phase Separate, actually coming out of solution and forming two or three distinct layers in the tank. We recently worked with a major fleet where a fairly large number of vehicles were fueled from a single tank and about one-half the vehicles were stored inside and the other half were stored outside. After a night with a 30°F+ temperature drop, several of the vehicles stored outside developed problems with significant amounts of water found in the vehicle tanks. After checking the storage tank and finding no measurable water, they looked for other possible causes including sabotage. After looking at many possible causes Enertech was consulted and we were able to describe the Phase Separation through temperature change scenario and determine that this was the most likely cause of the problems. Phase Separation can happen in an underground or an aboveground storage tank, a vehicle tank, a boat tank, in any type of equipment tank, and even in the gas can in your garage. When this happens, you can have serious and even catastrophic engine problems, without warning. When this Phase Separation occurs you will have an upper layer of gasoline with a milky layer of Ethanol and Water below it, and then in many cases a third layer of just water at the bottom. If this happens and you try to start the engine you can have one or more of the following problems. If your fuel tank pick-up tube is in the water layer, most likely the engine will fail to start. 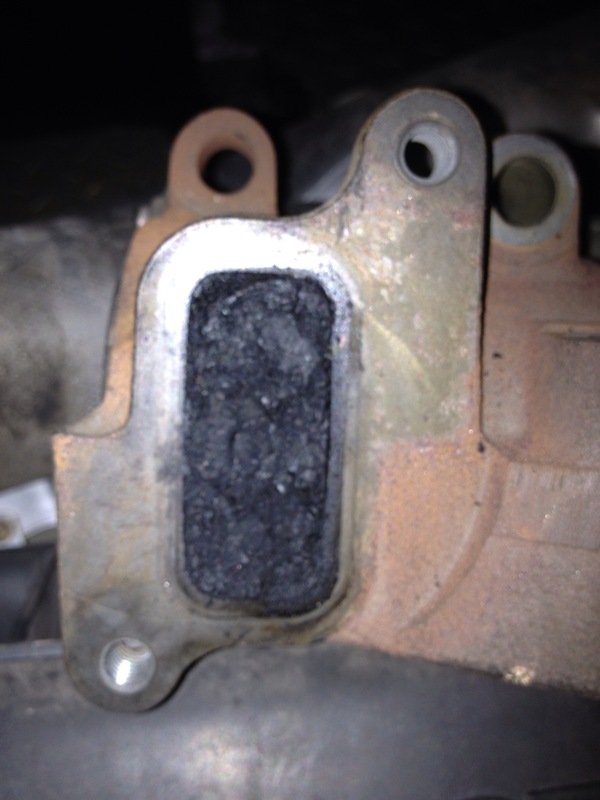 If the engine is running and suddenly draws water you can have damage from thermal shock or hydro-lock. If the pick-up tube draws the Ethanol-Water mixture or just Ethanol you can have problems where the engine will operate in an extreme lean condition, which can cause significant damage or even catastrophic failure. If the pick-up tube draws the gasoline, it will operate very poorly due to lower octane that is the result of no longer having the Ethanol in the fuel. Gasoline containing Ethanol provides further challenges and dangers for marine operators (Boaters) and other users of seasonal equipment such as motorcycles, personal water-craft, snowmobiles, ATV’s, RV’s, yard maintenance, generators, and other equipment. Ethanol is a strong, aggressive solvent and will cause problems with rubber hoses, o-rings, seals, and gaskets. These problems are worse during extended storage when significant deterioration will take place. Hoses will delaminate, o-rings will soften and break down, and fuel system components made from certain types of plastics will either soften or become hard and brittle, eventually failing. 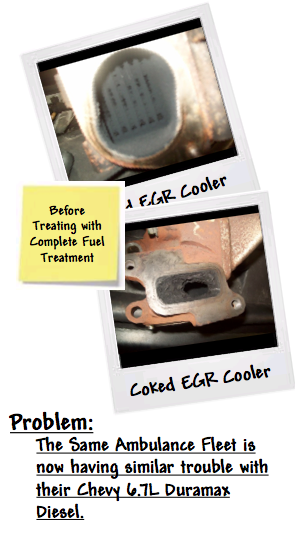 Fuel system components made from brass, copper, and aluminum will oxidize to the point of failure. Operators of boats with fiberglass fuel tanks built before 1993 can have actual structural failure as Ethanol will break down and pick-up some of the materials the tanks are made from. This causes two separate but equally serious problems. First the tanks can become so weakened that they can fail. In cases where the tank is part of the boats structure we have seen tanks become so weak that it is possible to collapse part of the deck just by walking on it. 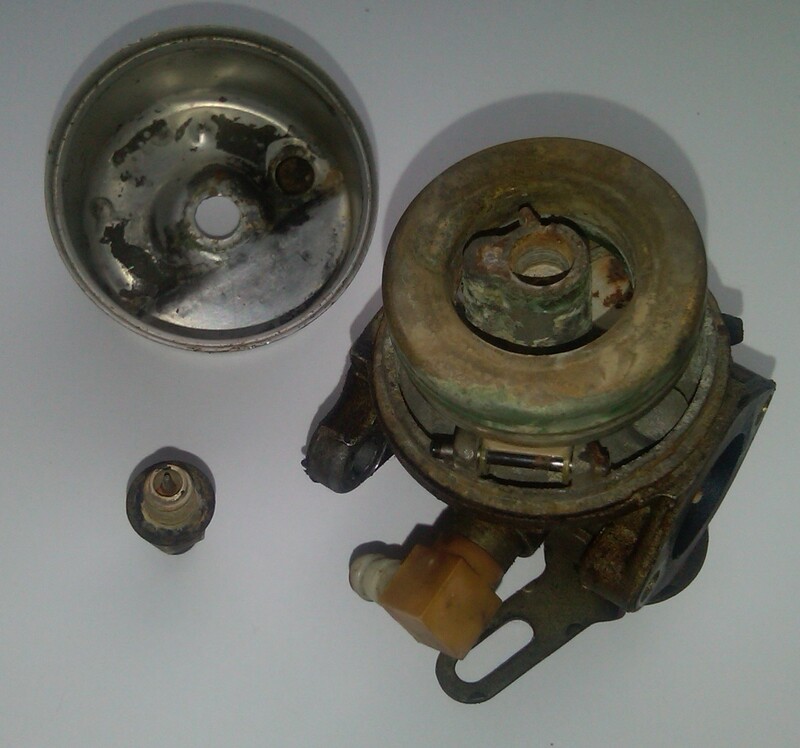 The second problem is that this material when dissolved from the fiberglass tank is carried through the fuel system and can cause damage to carburetors and fuel injectors and can actually get into the combustion chambers causing damaging deposits on valves and pistons. This material can be nearly impossible to remove without destroying the affected parts. Two-Cycle engines have a special problem with Ethanol blended fuels. Two-Cycle engines function because the oil added to the fuel bonds to the engines metal surfaces and provides barrier lubrication to all the parts requiring lubrication. When Ethanol is added to the gasoline, it displaces the oil and forms a primary bond with the metal surfaces. This bond provides virtually no lubrication and can result in significantly increased wear and even catastrophic failure in a very short amount of time. Until now the only preventative measures available to tank operators and end users was to try and make sure there was no water in the tank and that vents allowed a minimum amount of airborne water (humidity) into the tank. Gasohol, E-10, E-20, and E-85 are the terms that refer to gasoline containing Ethanol. For example the most common fuel available today is E10. 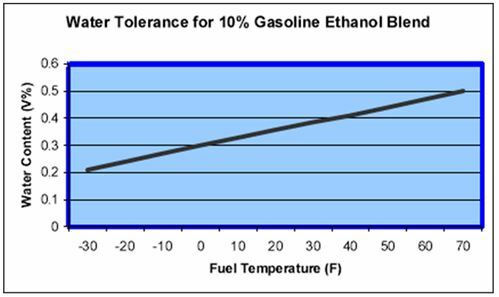 E-10 is 10% Ethanol and 90% gasoline, while E-85 is 85% Ethanol and 15% gasoline (Note: E-85 is actually E-70 in the winter in cold weather (Northern Tier) states. Ethanol has less energy (as measure in Btu’s – British Thermal Units) per gallon than does regular unleaded gasoline. This means that the more Ethanol found in fuel the worse your fuel economy will be. You use more gallons of fuel containing Ethanol to go fewer miles. For many years the refining industry used a chemical called MTBE to meet the oxygenate requirements set forth by the EPA. Generally refiners used 15% MTBE and 85% gasoline. However MTBE has now been virtually eliminated in the US due to its carcinogenic compounds and the huge potential problems caused by its pollution of as much as 75% of the ground water in the US and Canada. This has left Ethanol as the primary additive to meet Federal and State oxygenate mandates. Further the federal government currently subsidizes Ethanol with a $.51 per gallon tax credit that goes to the refiners or blenders. With E-10 this provides those refiners and or blenders with a $.051 per gallon subsidy on every gallon of gasoline that they sell. 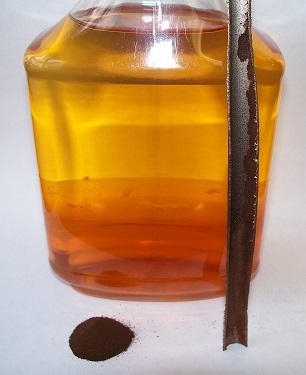 In many cases we have seen gasoline containing more than 10% Ethanol. We test regularly and have seen fuel containing 12%, 13%, and even 14% Ethanol while the pump shows only 10%. Increasing the amount of Ethanol increases the refiner/blenders subsidy and profit while further lowering your fuel economy. One more concern with Ethanol and RFG or Ethanol and CVG is that Ethanol when mixed with water; they readily form Gums in the fuel system much quicker than gasoline without Ethanol. These Gums coat fuel system components including filters, carburetors, injectors, throttle plates; and will then form varnish and carbon deposits in the intake, on valves, and in the combustion chamber. These deposits can coat sensors and plug catalytic converters. The good news is that we now have products available to prevent and control Phase Separation and that we can dramatically reduce or eliminate most of the problems caused by Ethanol in Gasoline. Enertech Labs, Inc.’s OctaPlus™ Gasoline Treatment contains a proprietary mix the latest technologies that will eliminate large amounts of water, prevent the formation of gums, varnishes, and carbon deposits and will actually safely and quickly clean existing gums, varnishes and carbon deposits aka. Combustion Chamber Deposits. OctaPlus™ used on a regular basis (every tank), will prevent or ameliorate new damage to tanks and fuel system components in all types of vehicle and equipment. OctaPlus™ will significantly improve fuel economy and drivability in all gasoline engines using Conventional and Reformulated Gasoline’s with or without Ethanol. OctaPlus™ provides a high tech fuel stabilizer to prevent fuel deterioration when fuel or vehicles, boats, motorcycles, and other types of equipment are stored for extended periods of time. Because of all the problems with Ethanol Blended gasoline’s we will list some specific suggestions and recommendations on how to deal with and resolve many of these problems. In bulk storage tanks where you believe phase separation may have occurred or where you are concerned it may happen. We suggest the use of a modified water finding paste such is made by the Gasoila company. This paste starts out brown, if you dip the tank with a measuring stick with the paste and it turns yellow (even light or spotty yellow), you have significant water dissolved in the fuel, if the paste turns solid yellow you have free water or phase separated ethanol water blend. If you have fuel that has not yet separated we recommend adding Gas-RX at one gallon per one thousand gallons of tank capacity (minimum of one gallon) in the tank. This will cause a dispersion reaction to take place which will pull an equal amount of water out of the fuel. You should then start a regular program of treating with OctaPlus™ at one gallon per fifteen hundred gallons of fuel. If you have fuel that has Phase Separated and you have either two or three layers you should arrange to have the tank pumped from the bottom to remove the one or two bottom layers containing the water and or the Ethanol/Water mix. (Note: you should check again with the paste before the technician leaves to be certain that all the Water and Water/Ethanol has been completely removed). You do not need to remove the gasoline. Treat with Gas-RX at one gallon per one thousand gallons of tank capacity (one gallon minimum). Check with water finding paste after 24 hours. If no red or yellow present then add clean fuel to the tank to working capacity and then treat with OctaPlus™ at one gallon per fifteen hundred gallons of fuel.